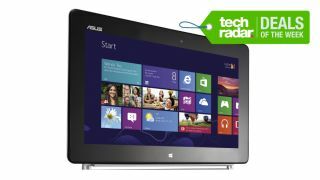 Once again, TechRadar has been scouring the web for the best tech deals and this week we've unearthed some bargain monitors, PC components, cases for your phones and tablets, cameras, games and more. Our top tablet deal this week is the Asus Windows 8 ME400C which is being sold at £100 off its usual price at Argos. Available in white, this Atom-powered tablet runs the full version of Windows 8 so you can install your favourite Windows programs on it. The tablet features 64GB of internal storage with a microSD memory card slot so you can add more, 2GB RAM and a 10.1 inch screen offering a resolution of 1366 x 768 pixels.